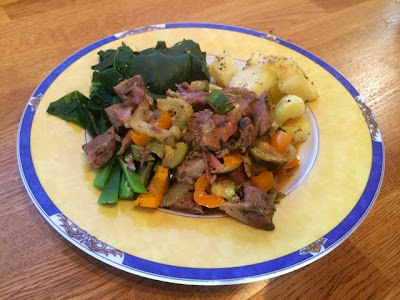 It’s always difficult to work out what to do with leftovers and so easy to get stuck in a rut of just cooking up some fresh potatoes and veg to go with the weekends leftover roast meat. I like to mix it up and try something a bit different. It’s surprisingly easy to turn the same ingredients into a totally different meal. 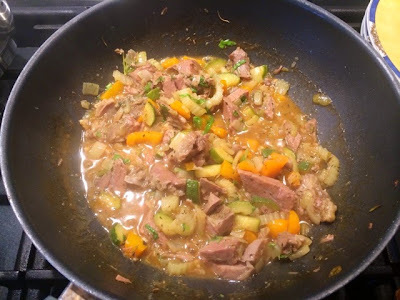 I often do a curry with leftover red meat but decided to go down a different route this time. 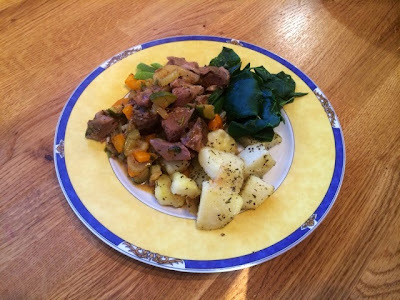 Slices of cold meat reheated from your Sunday roast can be a bit dry and tough, so stews are a great way of using it up as it’ll moisten the meat up again and the meat will fall apart into nice juicy chunks with all the new flavours. 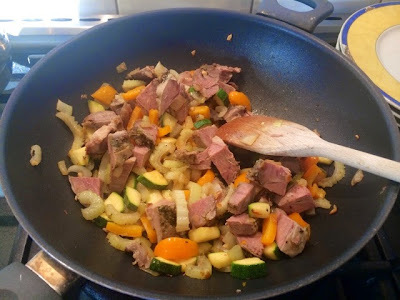 I used up the veg I had lying around but you can really throw anything you like into it. 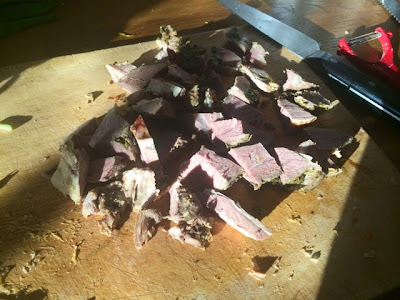 You can experiment with flavors, mint goes great with lamb and adding plenty of garlic and paprika gives the whole thing more of a Mediterranean flavour. 1. 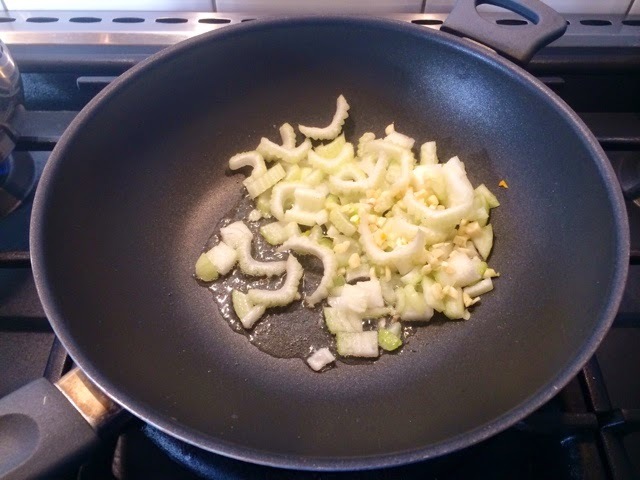 In a large pan heat a little oil and begin to fry the onion and celery until they begin to soften. 2. 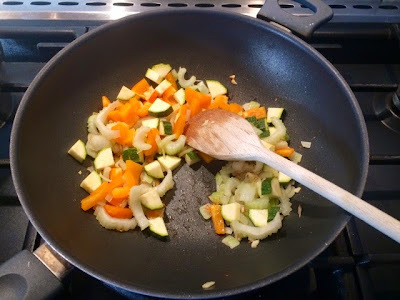 Add the peppers, courgettes and garlic and fry for a further couple of minutes. 3. 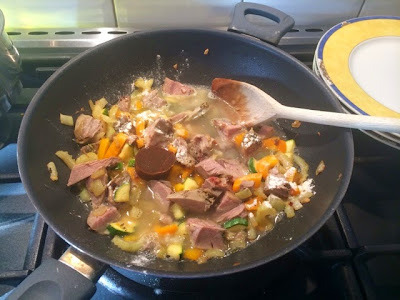 Dice up your leftover meat into bite sized chunks and add to the pan. 4. 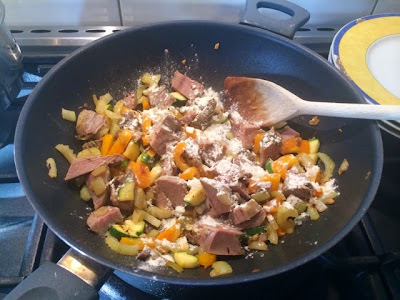 Sprinkle over a generous pinch of flour and stir through giving everything a good coating. Sprinkle generously with paprika. 5. Add the stock pot and pour in about 500ml water. 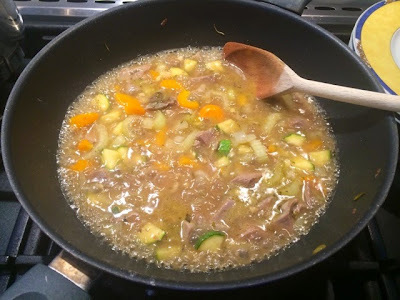 Stir thoroughly until stock pot is dissolved. 6. Add some more water to cover ingredients and bring to the boil. Turn down to a simmer for around 15-20 mins and allow the liquid to reduce. 7. By the time this is done, the potatoes should be done, remove them from the oven and dish up with a few large spoonfuls of the stew and greens. Served here with my Mini Minty Roasties.